The main COBRA measurement site on the coast of Hudson Bay. Develop understanding of the role of iodine (in concert with bromine) in Arctic gas phase photochemistry and aerosol production and evolution. Investigate the relative/combined roles of frost flowers, older sea-ice/snow pack, sea salt aerosol and biological sources in releasing halogens to the Arctic atmosphere. Increase understanding of the temporal and spatial variability of halogen-related ozone and mercury depletion events in the Arctic. Develop and evaluate parameterisations for emission of halogens to the Arctic atmosphere based upon observable ice and meteorological conditions, and use these to develop improved models of Arctic chemistry and emissions and their effect and feedbacks on regional/global atmospheric chemistry and climate. (1)	To perform initial laboratory testing and validation for new instruments/techniques to be used within COBRA. 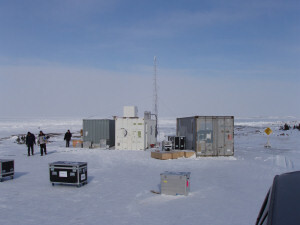 (2)	To produce a large high quality data set on the composition, properties and fluxes of gases and aerosols within a “bromine hot spot” of the Arctic boundary layer. (3)	To characterise the physical and chemical nature of sea-ice/snowpack surfaces, frost-flowers, and the biological nature of any under-ice diatoms. (4)	To determine the relative and/or combined roles of sea-ice, frost flowers, sea-salt enriched snow pack and biological sources in the exchange of halogens, ozone and particles in the field. (5)	To conduct laboratory studies with frost flower surrogates and to examine the effect of temperature, pH, and other surface constituents on the exchange of trace gases. (6)	To investigate the impact of iodine chemistry and sea-ice/snowpack/atmosphere exchange on ozone and mercury depletion. (7)	To quantify the role (if any) of iodine emissions on new particle formation in the Arctic. (8)	To determine the extent of halogen activation in autumn, throughout Hudson Bay. (9)	To test in detail current parameterisations of bromine emissions from frost flowers within the global 3D model p-TOMCAT against a range of measurements and to examine the combined effects of bromine and iodine on tropospheric ozone on both global and regional scales. With the exception of number 3 Manchester’s measurement and modelling activities contributed to all of the specific COBRA objectives, and objectives 4 and 7 were co-ordinated by Manchester PI’s. Manchester’s key contributions were to measure ozone and particle fluxes (ultrafine and total) and aerosol size distributions, to construct chamber systems to examine emissions from different types of ice surface and to carry out aerosol production and evolution modelling.